Like Laure, fall for one of the pieces in the exclusive collection Mimoki x Laure de Sagazan! 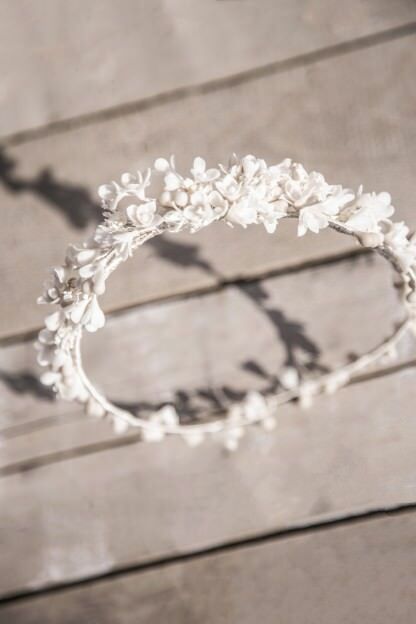 The AGUSTINA DE ARAGON crown is composed of small flowers and delicate pistils in cold porcelain and natural gypsophila. We are easily seduced by its sweet yet refined style. Handmade in Madrid, in the Mimoki atelier. This product is out of stock, we make every effort to get it back, sign up to be kept informed. Laure is proud to present to you an exclusive with the Madrid brand, Mimoki. Their common love for beautiful pieces and craftsmanship gives birth to a collection of exceptional pieces in the names of queens and other women of power who have marked their era. A doubt about the model? Contact us via the dedicated form, and we will respond very quickly! Great care is taken for each shipment and has a tracking number. International Delivery: contact us for a personalized quote. For more info, consult the "Shipping and Returns" section. Votre mètre doit être à l’horizontale en faisant le tour de votre poitrine à l’endroit le plus fort. Votre mètre doit être à l’horizontale en faisant le tour de votre taille à l’endroit le plus fin. Votre mètre doit être à l’horizontale en faisant le tour votre fessier à l’endroit le plus large.